Reports from the lab: General Science and Biology: Which chip is the greasiest? General Science and Biology: Which chip is the greasiest? This week in science we asked the following questions: which brand of potato chip is the greasiest and more importantly, how can I be sure? We went about answering them by carrying out 3 tests. The first 2 were a touch and a taste test in which the kids rated the chips on a scale from 1-5, with 5 being the greasiest. Then the kids were challenged to come up with a more quantitative test, one based on measurement. Some kids crushed equal amounts of each chip on a piece of graph paper and then compared the sizes of the different oil stains. 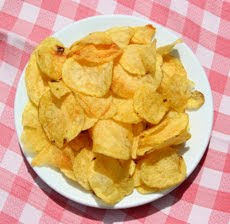 Others compared the weight of the chips before and after crushing; the assumption being, the greasier the chip, the more oil lost in the act of being crushed on a piece of paper. Another test consisted of soaking different chips in water, removing them, and then comparing the amount of oil observed sitting on top of the water. After carrying out our tests, we tested our tests. We read the nutritional information on the packages and reviewed our data to see which test was actually the best. Finally the kids thought about how they could improve their tests in the future.